In total ten participants from Switzerland as well as two from the United States visited and worked with iChange in Zambia during 2015. Aside from our volunteers, all iChange board members were present at one time or the other during this year to advance various focus areas of our work. Daniel was accompanied by most of his family as they were interested to experience and share the work he had done on location in Zambia over the past years. 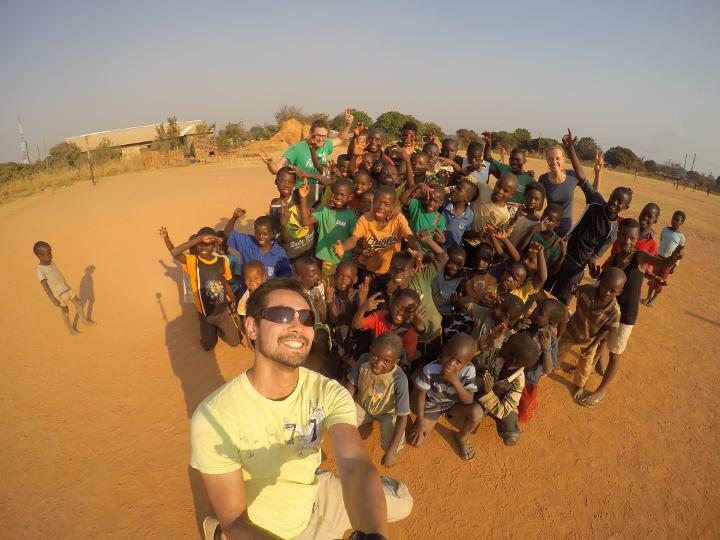 Stefan, for the first, was able to visit Zambia together with his wife, who, going forward, is excited to contribute to our work in Zambia through her experience with other NGO organizations and projects. At the center of our work was once again the Mackenzie Community School. At the beginning of 2015 we had defined an increase in educational quality at the school as one of our main objectives for 2015. This was - and is - a prerequisite for our medium term goal of expanding the school over the next years. After detailed and comprehensive discussions with various other local schools as well as the Ministry of Education a decision was made in summer of 2015 to hire two certified and degreed teachers. Until then the school had been run and managed by dedicated local community volunteers, with financial and logistical support from iChange. Since September 2015 a fully certified primary school teacher is now working at Mackenzie Community School; in addition, management and leadership of the school's operations are now in the hands of a college-degreed head teacher. In order to create equality in this new phase for the Mackenzie Community School, the first three months after adding the two new teachers were defined as a strategic evaluation period for all teacher, new and existing. It was encouraging and positive for us to see that the two new teachers were able to generate a noticeable positive impact on the school within only a short period of time. This was also recognized and confirmed by the local population. Two of the previous three teachers also will continue their work at the school, with the intention that over the next years they will obtain full teaching certificates. In order to facilitate this objective, iChange has committed to supporting both teachers in their professional development. In accordance with the school's stated strategic objectives, one of the former teachers has discontinued their teaching activities and is focusing on other activities. As a replacement yet another certified teaching staff was hired early in 2016. The school's leadership, in cooperation with our long-term Coordinator in Zambia, focuses in particular on the school's administrative management as well as establishing and further cultivating close contacts and interactions with parents, representatives of the community, as well as the government. By doing so the remaining teaching staff is able to exclusively focus on class delivery and teaching matters as well as the quality of education at Mackenzie Community School. iChange will closely monitor and then evaluate the school's continued progress over the next six months before starting to define and formulate the next expansionary strategic steps. The Educational Scholarship Program in Mackenzie will be continued as before, but no new scholarships will be issued for the foreseeable future. This decision further serves to underline our full focus on the continued development of Mackenzie Community School. However, in the Twapia community, where iChange started new partnerships with the Madalitso Wits Sports Academy and the Eagles Wings Community School in 2014, the Educational Scholarship Program will be slowly expanded. This is based on the very encouraging and satisfactory results of all of our participants in this program in 2015. In total, the program now supports eight participants in Twapia and two in Mackenzie. In other developments, a targeted monthly donation from a former volunteer now directly supports the Madalitso Wits Sports Academy in their endeavors to expand and professionalize their after-school soccer program. This program not only provides activities for young adults who otherwise might end up in trouble, but also gives them stability and encouragement in an often very difficult economic and societal environment. For this purposes, Brian, the program's manager, incorporates important sanitary, health and other prevention topics into his training plans. Our Microfinance Program continues to exist, but is currently not being expanded either. During 2015 we conducted various meetings with a renowned local university to discuss possible improvements and a more local management of this program. In a proposed partnership, local business students are to be given the opportunity to coach program participants in the planning, setup and running of their microcredit-supported businesses. We hope that first steps to formalize this partnership can already be put in place during 2016. Altogether, we are very happy about a busy but successful year 2015. In particular at our focus project, the Mackenzie Community School, we were able to make important and fundamental steps forward. We hope and will our best to continue this path also in 2016. Our special thanks, as always, however, goes to our donors who have yet again supported us so generously during the past year. With the hiring of three new teachers our financial commitments have multiplied. As important as these steps were strategically, in the end they only became possible because of our many regular and one-time donors who support iChange.